The process of economic growth in India is dispossessing millions of small-scale traditional agricultural and non-agricultural producers, who mostly find shelter in the informal sectors of the economy. This column outlines the peculiar phenomenon of “deepening dualism”, reflecting not only the formal-informal divide but also a fracturing of informality. The author calls for a response of “dualist policy design”, promoting on the one hand, linkages between the formal sector and the more dynamic advanced part of the informal sector, and on the other, a clustering of the smaller-scale informal firms. While India’s economy is growing steadily, the nature of its structural transformation reveals a disturbing pattern. According to the India Labour and Employment Report 2014, despite a continuing structural shift of labour out of agriculture (the primary sector), most of the employment expansion in the non-agricultural sector is unorganised and informal, characterized by low incomes and poor work conditions. Sectoral analysis suggests declining employment growth in agriculture and a significant increase in low-level services. In the case of manufacturing, employment growth is low. Furthermore, the majority of employment expansion in the secondary sector is confined to low-paid construction work. Thus, informality persists, and it is even expanding despite the growth of the formal sector. So is India experiencing a progressive transformation within itself as an effective escape from agriculture? Or is informality persisting and even spreading as another site of misery (along with small-scale agriculture)? And finally, can growth of the formal sector and the overall economy resolve the problems of the informal sector or do these phenomena actually aggravate the problem? Contrary to dominant claims and popular perceptions, we have shown through our continuing research over more than a decade that the growth of India’s economy (driven by its formal sectors) is the prime cause of the expansion of the informal sector. 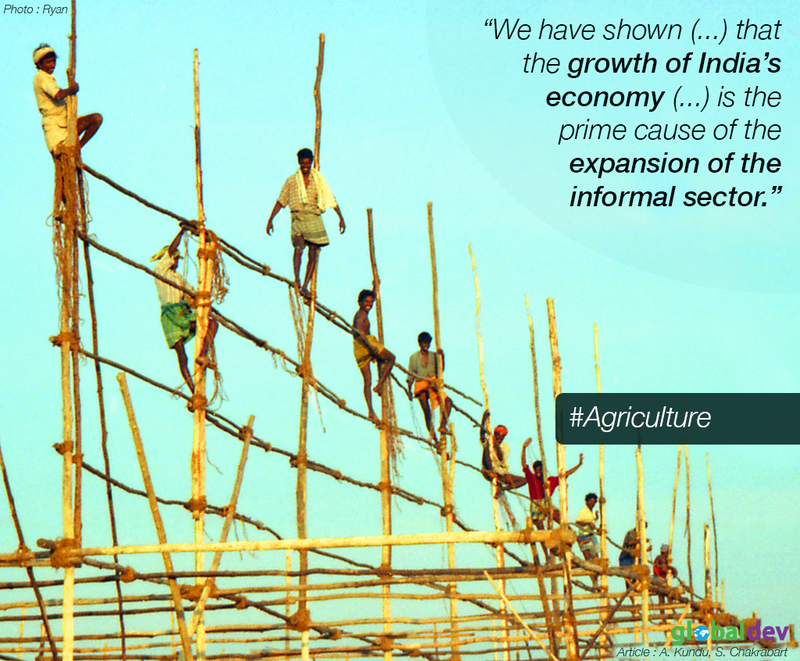 Economic growth pushes the distressed agrarian and traditional non-agrarian population towards the burgeoning informal sector. But only a part of this population is able to reap the benefits of growth through its linkages with the formal sector. The larger part of the non-agricultural informal population remains dissociated from the dynamic modern segments of the economy; its members are engaged in low-level production depending on mostly local small-scale resources and producing for local markets. Furthermore, this vast majority of dispossessed people roams from one profession to another as ‘neo-nomads’. Thus, we find a peculiar phenomenon of “deepening dualism” (instead of its much expected withering away). Not only is there a formal-informal divide, but informality is further fractured. More fundamentally, we show that this duality is, in fact, aggravated by the expansion of capitalist formality. Instead of driving inclusive growth, increased formality produces a fractured and distorted economic structure. It ensures the persistence of a fissured informality. The (heterogeneous) informal sectors expand in tandem with the formal sector through the operations of push and pull factors: as formality grows, small-scale farmers as well as traditional indigenous non-agricultural producers are suffocated because of a resource drain. The distressed small-scale producers are pushed out of agriculture and non-agriculture. Economic growth based on an expansion of the formal capitalist sectors requires enormous resources. This induces a resource drain from the non-capitalist sectors, especially low-level agriculture and allied activities. Thus, ‘Jal-Jangal-Jameen’ (water-forest-land) are either converted to suit the demands of the capitalist growth process through economic means or expropriated with the use of political power. This process fuels economic growth, but dispossess millions of small-scale traditional agricultural and non-agricultural producers. This marginalised mass finds its shelter mostly in the informal sectors. But only the fortunate few can get a refuge in the advanced segments of this informality (being pulled by the formality itself). A very large part of this migrant population is pushed into underpaid and small-scale informal activities. Thus, informality expands along with the deepening of its intra-sectoral inequality or duality. If informality (especially the larger portion that remains outside the extended circuit of capital and formality) has to survive and thrive, it has to negotiate with the power of capital and formality. It cannot avoid the aggressive dynamics of the formal sector. The challenge of informality can be relevant only if it can act as a cohesive collective; and a “cluster” form of development of the informality could offer a respite. The prospects of clustering the small-scale informal firms and the organization of socio-economic and political power, as well as the abilities of the cluster of informal firms vis-a-vis the formal structures, could provide material for important research. The dynamic advanced part of the informal sector could prosper along with the formal sector because of its linkages with the latter. Hence, policymakers could focus on these linkage effects for the uplift of this segment of the informal sector. But for the other and more troubled portion of the informal sector, a deliberate promotion of cluster industrialization (pitted against formal sector expansion) could be essential. Thus, an expansion of dualist informality calls for dualist policy design. Anirban Kundu is currently holding the position of senior lecturer (Economics) in the Indian Institute of Plantation Management Bangalore, India. Saumya Chakrabarti is currently holding the position of Associate Professor (Economics) in Visva-Bharati University, India.